After a 17-year run of unbroken profitability, [[Southwest]] posted a $120 million loss for the third quarter of this year. The airline actually operated at a profit—a healthy $69 million at that—but according to the New York Times, plummeting oil prices forced Southwest to “write-down the declining value of its hedging contracts for jet fuel” to the tune of $247 million. Should loyal passengers be worried about the airline’s financial health? Not really, or at least not yet. Losing $120 million is bad, make no mistake, but a $69 million operating profit in this economic climate is extremely strong. In fact, that number actually surpassed industry analysts’ expectations. Southwest CEO Gary Kelly called the fuel hedge decline a “fluke,” which indeed it was, and said the airline doesn’t expect oil prices to continue fluctuating as wildly as they have. Still, Southwest’s loss illustrates the fine line separating airlines from financial health and financial unease in this volatile economy. Much of Southwest’s strength comes from calculated fuel hedging, which has thus far kept its fuel prices low. But hedging, no matter how carefully it’s done, is still a gamble. 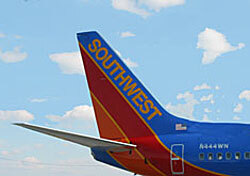 With 75 percent of its fuel already hedged for 2009, Southwest is no doubt hoping its bets are strong.